Standard Airtime Rate of $0.10 also applies to Nationwide Long Distance, including US Virgin Islands, Puerto Rico, Guam, and Mariana Islands for calls made and terminated within the AirVoice Wireless Network Coverage Nationwide. Other international long distance per minute rates: Canada and Mexico -- $0.25 + Local Airtime Charges; Mexico Mobile Numbers ONLY-- $0.50 + Local Airtime Charges. Dial 611 to get the rates for other countries. Maintenance fee of $1.00 per month. Airvoice number is required to be provided in the shopping cart, and minutes will be directly loaded to the provided Airvoice number. 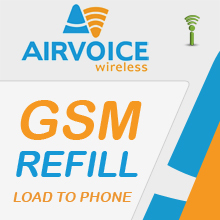 We will be calling Airvoice IVR or refilling it through their website to load the pin for you so please give us at most 1 hour to load it during our business hours. If you ordered outside of business hours, we will load it for you on the first hour that we open. Due to the manual nature of this product, this is not covered in our Instant Delivery Guarantee.